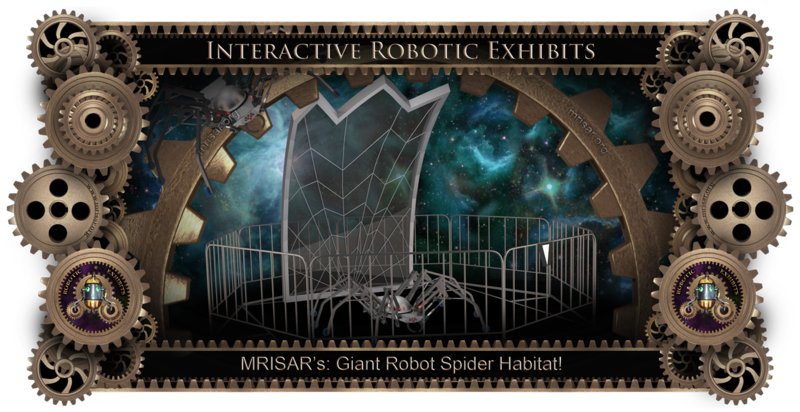 Robotic Exhibit; MRISAR's Interactive Robot Spider. Dare to try to tame, challenge and feed light to a four foot diameter light eating robot spider. The spider has a dexterous autonomous body and legs with sensors that allow it to react and move in its environment and to respond to certain aspects of your actions. The spider moves up and down on a strand of cable web and determines its actions based on the movements of beams of light that the museum visitor controls. It also reacts to ambient sound as another aspect of determining its aggressive and reclusive tendencies. In these aspects and via the spider’s ability to sense and orchestrate the movements of its limbs and body, it is similar to the aspects of real life forms within the insect and animals kingdoms. The open structural, mechanical and electrical format of the spider conforms to STEM education! It is presented in the exhibit in its steel web habitat. A 10’ diameter railing is the boundary of the exhibit environment. 10’ x 10’ foot print.